Hegeler & Söhne is a supplier of the fibre-cement industry since 1960 and in 1981 we started selling PVA-fibre to the industry for reinforcement of fibre-cement sheets, and we accompanied our customers since then in their conversion from asbestos containing to non-asbestos production. Since 1994 we offer PVA-fibre of first class standard from China. 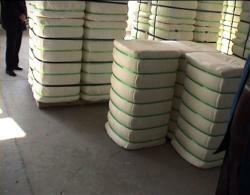 It is sold and used in those markets where asbestos has been or will be banned.